At the beginning of the year I made some reading resolutions, one of them was to focus my reading on finishing series that I had begun. I am a serial offender of starting (and loving) a series and then leaving the sequels to languish on my shelf for years! Must have rated the first book at least 4 stars. This was to ensure that I was at least interested enough in the first book to motivate myself to continue. I have begun and abandoned too many series to count, and I was determined not to let those books distract me from my goal. It’s okay to abandon series that aren’t for you. Already own the sequel/s. 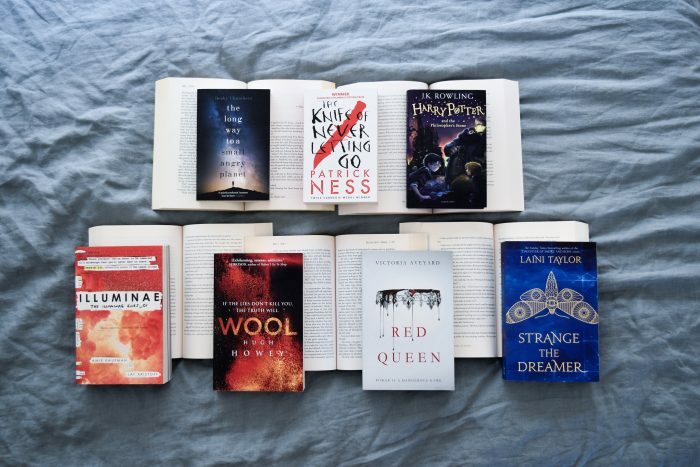 I own more than 140 unread books at last count, and many of them were sequels, so it was important that I was using this challenge to reduce my to be read pile (TBR) not increase it. As the year comes to a close I am very pleased with the result. By setting myself a challenge I was able to focus my reading and make a big dent in my unread series. I think simply setting a goal, deciding on criteria and focusing my attention was really what helped me achieve this result. But I also had a secret weapon: Audiobooks! I listened to ALL these books using my subscription to Audible (not sponsored, just a fan and subscriber). By having the audiobooks queued up I never had a chance to avoid them, and I could continue to read newer releases in paperback. My commute, household chores and time running errands was all filled with these stories throughout the year. If you haven’t tried audiobooks Audible has a free first month trial, and there are apps like Librivox that have books for free, plus most public libraries offer audiobook borrowing services. I still have a few series remaining on my shelf that I didn’t get to this year (The Passage by Justin Cronin, and the Southern Reach Trilogy by Jeff VanderMeer in particular), but I will continue this challenge into the new year. I highly recommend all of the books below, they were each quite different, but I loved all of them in different ways. Class politics, discrimination based on blood, and a society ready for revolution. On a planet where all the thoughts of men are audible, a boy stumbles into an adventure that will change his life and the world. A boy librarian, children living hidden in an angel, and a city whose name was eaten by a god. Taylor is a master at crafting beautiful, richly imagined worlds filled. Fast paced, emotionally gut-wrenching, epistolary novels set deep in space. Different protagonists in each book, but they are closely interwoven. My favourite sci-fi series of all time, which is very high praise. The books have loose links between them but are closer to standalone books with different settings and protagonists within the same world. Do read them in order though. All that remains of humanity lives in a silo underground, society lives by rules laid out hundreds of years before. There is so much tension, social commentary, and corruptions of the highest order. There isn’t anything I can say about this series that hasn’t already been said. I reread only the Half-Blood Prince and Deathly Hallows in 2018. The audiobooks narrated by Stephen Fry are perfection. Have you have read any of these series – or like me, do you struggle to finish what you start?